March 2018 – With the Cape Town water crisis and the increased costs of water in general, many domestic consumers are installing grey water systems to re-use water for flushing toilets or irrigation. 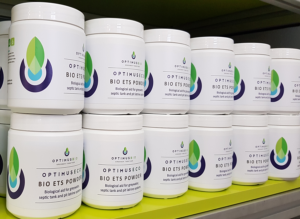 In response to this growing need, OptimusBio has utilised the ETS technology developed by the CSIR, to make a biological treatment product for grey water. We have also expanded the application for septic tank and pit-latrine systems. The technology has been used for industrial purposes for many years, but we have now formatted it into an easy to store, affordable 500g tub with scoop for domestic users. The product can now be easily added to these systems daily, at any convenient entry point. The product contains 100 doses which means it will last you more than three months. Now available at www.optimusbio.com or drop us an e-mail to info@optimusbio.com for trade stock.